When we make predictions, we mentally move from “If” something will happen to “What” must eventually happen. If our predictions include key beliefs, forces, principles, causes and values, they also tell us “Why” it must happen. In fact, a “What” prediction that doesn’t start with the “Why” isn’t worth very much, as it doesn’t say anything replicable and falsifiable about the systems involved. So good prediction is about both the Why & What, in that order. The Why & What tell us something useful about predictable developmental destinations which appear to lie ahead of us. This includes those destinations that seem so preferable to so many that they are in fact also developmental. Think for example of key attributes of the kinds of future societies (equitable, innovative, sustainable, safe, responsible, self-actualized) that we want to create, in all adaptive cultures. What always remains far less predictable, though we will still make bets there as well, are the How, Who, Where & When, or the evolutionary paths and choices that we will take to get to those foreseeable destinations. Consistent with the nature of development and evolution, for any process we are considering, the Why & What are often the longer range or more permanent futures, while the choices of the How, Who, Where & When are shorter range or more temporary futures. Of course the timescales for “long” and “short” and “permanent” and “temporary” are relative, not absolute. If predictable “long-term” developments ahead are only weeks or days away, your unpredictable “short-term” choices will be measured in days or minutes. The Why & What developmental timescales helps us see the appropriate horizons for the evolutionary choices we are contemplating. Not only is this approach great Three Ps foresight, as it starts with certainty, but it works for great leadership, and great sales approaches as well. Leadership and influence are also often first about the Why’s, the key beliefs, forces, principles, causes, and values, then the What’s, then finally the How’s, Who’s, Where’s & When’s. 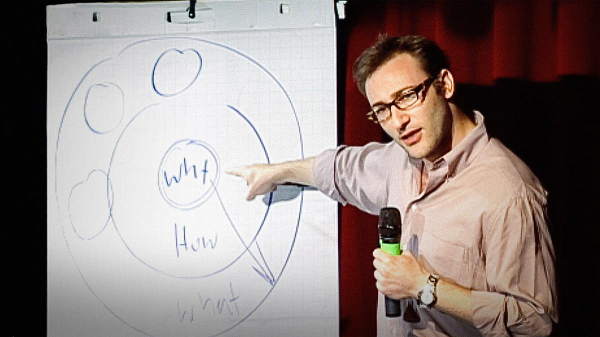 Simon Sinek makes this point quite well in his TEDx talk, Start With Why: How Great Leaders Inspire Action (2009). See also Sinek’s Golden Circle Model, which proposes that individuals, firms, and brands need to know their unique Why, but too many know only their What, or at best, their What and How. See also his book Start With Why, 2009. Whenever you can, strive to lead with your Why story, those things you believe are critically important or inevitable, but cannot rigorously prove yet, and you will attract other leaders who share your Why. Early adopters will do and buy things based on the Why story. They choose their Why in accordance with the kind of world they want to live in, and the stories they want to tell to explain their thoughts, beliefs, and actions, to themselves and the world. If you lead instead with the evolutionary details, the How of your cause, plan, product, or service, without providing the critical Why first, leaving that developmental part unsaid, your product or service will be just another choice in the marketplace. You won’t inspire. When we see the largest Why’s & What’s that are relevant to our future, that also allows many subsidary Why’s & What’s to become clear as well. Seeing these developmental futures, and using them to inform, focus, and prioritize, our possible and preferred futures is one of the greatest benefits of understanding accelerating change. For example, once we truly understand Why accelerating information technology is the primary system creating wealth on our planet today, and the primary system generating inequality, and the primary system opening up personal empowerment options for our future, we can ask What coming developments are most helpful to humanize that acceleration. IT advances like inexpensive wired and wireless broadband, the internet of things, groupnets, conversational interfaces, and digital twins deserve a special place in our nation’s science and technology funding and economic competitiveness policies. Their Why’s are so socially and economically valuable, it is amazing so few of us are presently fighting for them. What’s not so clear is exactly How we’ll get many of these next-generation IT systems built. For example, which techniques will take to conversational platforms the fastest? Will deep learning be key? Who will lead the charges and Where it will they happen first? Will Google and a small number of other large companies be first to scale? What startups will also be involved? Finally, When the key breakthroughs occur (two years? ten?). When we understand the Why & What, we can get excited to make them happen, in a variety of ways. For another example, it is predictable that most cars on the road will soon drive themselves (another important What). We also know Why this must and will occur, and should lead with that information. The relevant hardware and software are exponentially improving their performance/price ratios, experimental models are working very well so far, and self driving cars will give us back our commuting time, significantly increase traffic density and efficiency, and will prevent 1.3 million annual global automobile fatalities. For many of us, the prevention of 1.3 million annual fatalities is by far the most important Why story. But each of the Why’s above are motivating, and all should be made clear at the start, to motivate change. What isn’t so clear is exactly How this will occur and Who will do it. Will Google’s mapping based approach be first, or will we need more AI in the car itself? Where will it happen first? In the US? Germany? Will trucks get it first? Low-speed neighborhood electric vehicles? High end luxury cars? When will the first commercial solutions emerge (2020? 2030?). It’s predictable that we will need to manage planetary resources far more sustainably in coming years in many ways (a very important What). It’s also clear Why we have to do this. Human population will continue to increase at least until mid-century, and there are clearly not enough of many nonrenewable and renewable resources for emerging nations to make the same wasteful journey to first world living standards that the citizens of current developed nations made. But for many sustainability issues, the full size of the coming need (the full Why & What) still isn’t clear. In particular, we need to know What accelerating technological remedies, including efficiencies, innovations, and automation, will do to affect the particular sustainability problem. Consider food. As global population continues to grow to mid-century, some folks claim we will need to grow more food in the next 50 years than we grew in the last 10,000 years (or “All of History”), as Megan Clark of Australia’s CSIRO said in 2009, quoting an expert at a UN Food Conference in Iceland in 2007. Is that right, or is the World Bank’s estimate that we’ll need to grow 50% more food by 2050 (a much narrower claim) more accurate? Or are both of these estimates wrong, and is Richard Ewbank at The Guardian correct in claiming that we already grow enough food to feed 10 billion people? Ewbank argues that our key food sustainability challenges this century be reducing overconsumption, waste, politically-mediated hunger, and further soil degradation and climate change. Clearly we need, and must demand, increasingly better models of Why we need to grow more food, and thus What is the real size of the food growing challenge, and thus what are its most likely set of social and technological solutions, in coming decades. Those estimates still won’t answer the How, Who, Where, and When of food growing, but they will powerfully constrain the set of futures we should prepare for. Will we need a second massive Green Revolution to feed the next generation, or will more modest Efficiency Revolutions in watering, growing, transportation, and other areas will get us to where we must go, or at least most the way there? The answer to this question will influence many things, including which countries further adopt GMOs, which we may otherwise continue to treat with high-levels of disdain and regulation, unless we think we need them. Let’s consider a related What subquestion, one that may also be predictable today. Will local (say, under 200 miles) or nonlocal (over 200 miles) food production for human beings be the largest component of food consumed fifty years from today? Which trend is winning today, and how fast are each improving? Today it often makes more economic sense, in terms of both carbon and environmental impact and sustainable resource use, to ship food globally from areas of plentiful water, than to try to bring water to and grow food in parched areas, like the US Southwest. People who want to have their food grown locally often don’t like to admit this fact, but it’s what we do very well today. If global warming continues, if desalination improvements remain slow, and if our transportation systems become rapidly more efficient, decarbonized, renewable, and automated, all of which seem likely, I will bet we will see more nonlocal production of food (food shipped more than 200 miles) than we see local production at least out to 2065. The local production vision will keep growing in importance, but will remain a minority solution. In all developed nations and cities that are wealthy enough to support the local production option, we’ll see progressively more farmers markets, vertical farms, SPIN farming, and other local farming amenities. But even without good data on this point, I would presently bet that local production will remain by far the secondary supply (perhaps only a third of our supply in 2065), while recognizing that many sustainability futurists would presently disagree. Even though most aspects of the future of food production must remain unpredictable, many things are predictable, with better models, definitions, and data. The more we try to predict, the more we can forsee. Let’s look a bit closer now at both evolutionary and developmental thinking, and some of the factors that foresighters use to explore the possibility and probability space. We’ll discuss preference foresight tools and factors only briefly at this time, within these two categories, leaving a more detailed examination for another time. We will organize our survey of evolutionary factors and developmental factors into three rough groups (Evo 1, 2, and 3 and Devo 1, 2, and 3). Each group is poorly defined and incomplete, so don’t look at them too closely. All of these factors are both evolutionary and developmental as well, in different contexts. But each also tends to be used more often in evolutionary or developmental ways in practice, so that is how we have made the categorization.